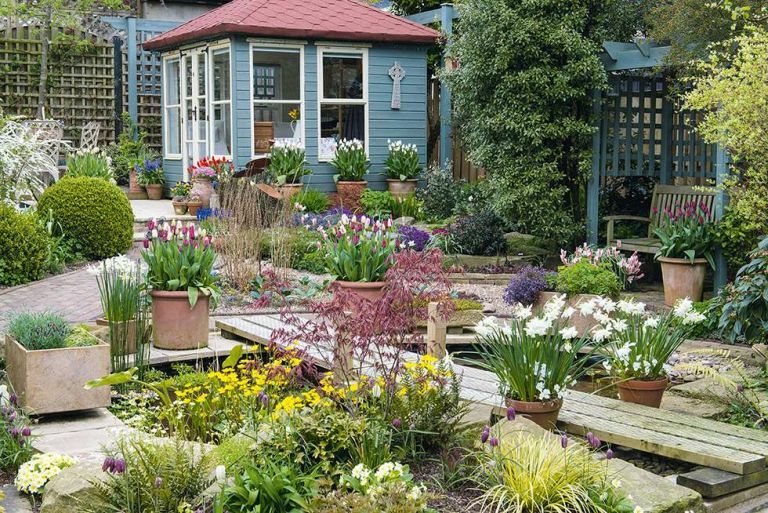 Julie and Tony Peckham have spent 16 years creating a vibrant garden for their rural home. Discover what they've achieved, then browse more real home transformations and find out how to plan, design and cost your garden transformation. The first major job centred around the main path that leads from the patio doors at the back of the house to a focal point – an arbour built by Tony – on the opposite boundary. ‘Near the house, I wanted a formal feel with paths that were straight and wide enough for two people to walk side-by-side,’ Julie explains. Further away, on the other side of an arch leading through a trellis divider, there’s a more informal, organic feel, with narrow, curving paths that lead around ponds. ‘I love the sound and sight of water,’ she adds. How to design a garden path: ideas and advice. Originally the paths were grass, which proved hard to maintain. So, in 2008, they were replaced with block paving, a project that was like doing a three-dimensional jigsaw: Tony fetched and carried the blocks, and Julie laid them. ‘It was a challenge to create smooth curves, and Tony had to cut a lot of the paving blocks to fit — it was very time-consuming, but we are delighted with the end result,’ says Julie. The soil is a rich, well-cultivated loam that was once farmland, and the plants thrive in it. Flowers feature throughout the garden, sometimes in collections – such as the blue grape hyacinths planted in terracotta pots beneath an old Bramley apple tree – or in combination. ‘I love the way the blue *macropetala clematis is scrambling through a white exochorda beside the house,’ says Julie. This flexible approach works well, and as her interest in alpine plants has grown, two rock gardens have been added to accommodate them. Come spring, these feature pink aubretia, blue speedwell, primulas, diminutive phlox and saxifrage. ‘I like to grow early spring flowers,’ she says. Find out how to choose plants for your garden. The smaller south-facing side garden measures eight by five metres. Originally it contained herbaceous plants, but it was blasted by winds. ‘We replanted it with a small parterre of low box hedging and created a water feature,’ says Julie. Separated from the parterre by a wide entrance path, a shady spring border rests in the shelter of a privet hedge. It is planted with tough, low-growing spring- flowering plants, such as erythroniums, hepaticas, hellebores, windflowers and snowdrops, sheltered beneath trees and shrubs, such as star magnolia, contorted hazel, holly, viburnum, purple elder and a large flowering currant.